Similar to the Freedom Mini Bluetooth keyboard, this Freedom Slim keyboard lets you add qwerty input to non-qwerty phones—the iPhone, perhaps? 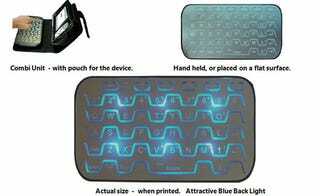 The keyboard itself has Moto RAZR-ish design, including blue or orange backlight and magnetic pads to go with its included case. It's good for 4 hours of use and 100 hours standby and can be recharged via mini USB. May not be useful for most people, but great for those who do a lot of texting.